Ecobnb is the meeting point between responsible travelers and eco-friendly accommodations, that are investing in a better future. The ViaggiVerdi – Ecobnb blog was born in 2012, in order to tell travel stories that respect environment, places and local communities. At the beginning of 2013, halfway between California and Italy, the ItalyGreenTravel Blog is born. In 2015 it becomes Ecobnb to collect all the sustainable tourism experiences in Europe and in the world. We address travelers interested in sustainable tourism. We talk about experiences in contact with nature, routes to rediscover lesser-known corners of countries, slow journeys, on foot, by bicycle or on horseback, holidays to rediscover the traditions (including culinary) and the authentic life of the places we visit. 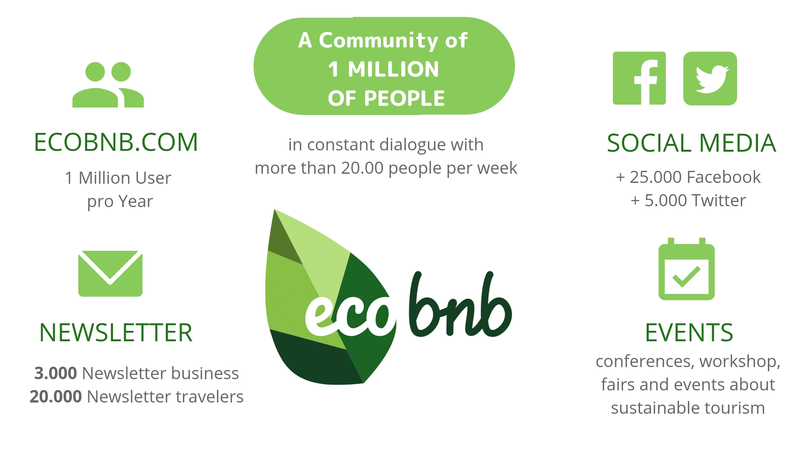 What is the mission of the Ecobnb Blog? – To contribute to enhancing the small communities, tour operators and accommodation facilities that are investing in a better future.